The coffee and cafe capital of the world, Melbourne, is a city that boasts of a charming heritage and history. 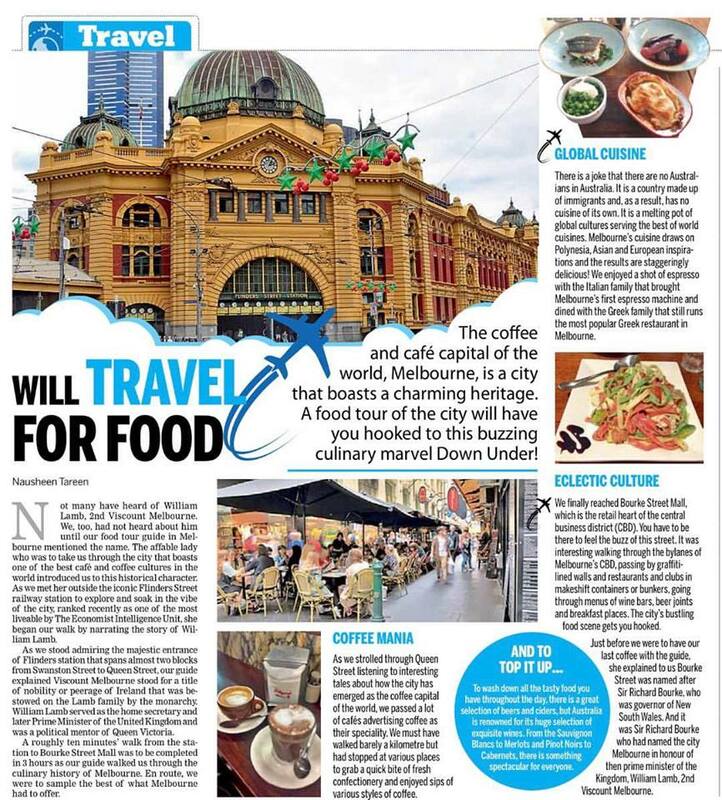 A food tour of the city has Nausheen Tareen hooked to this buzzing culinary marvel down under! Not many have heard of William Lamb, 2nd Viscount Melbourne. We too had not heard about him till our food tour guide in Melbourne mentioned the name. The affable lady who was to take us through the city that boasts of one of the best café and coffee culture in the world and an equally vibrant food and nightlife scene introduced us to this historical character. As we met her outside the iconic Flinders Street railway station to explore and soak in the vibe of the city, ranked recently as one of the most liveable by The Economist Intelligence Unit, she began our walk by narrating the story of William Lamb. As we stood admiring the majestic entrance of Flinders station that spans almost two blocks from Swanston Street to Queen Street, our guide explained Viscount Melbourne stood for a title of nobility or Peerage of Ireland that was bestowed on Lamb family by the monarchy. William Lamb served as the home secretary and later Prime Minister of the United Kingdom and was a political mentor of Queen Victoria. A roughly ten minutes’ walk from the station to Bourke Street Mall was to be completed in 3 hours as our guide walked us through the culinary history of Melbourne. En route, we were to sample the best of what Melbourne had to offer. Sir Richard Bourke had named the city Melbourne in honour of then prime minister of the Kingdom, William Lamb, 2nd Viscount Melbourne. Within a few paces we realized clearly the city can’t have enough of coffee, it just loves to serve and drink the beverage. As we strolled through Queen Street listening to interesting tales about how the city has emerged as the coffee capital of the world, we passed a lot of cafes advertising coffee as their specialty. Doughnut and coffee, in fact, appeared to be one of the most popular meal on the go. We must have walked barely a kilometer but had stopped at various places to grab a quick bite of fresh confectionary and enjoyed sips of various styles of coffee. We then passed by French, Greek and Italian outlets that either served continental fare or advertised dessert and coffee combos. Just as we stopped to enjoy the famous Melbourne coffee with a few cupcakes our guide returned to speaking about the history of the city and informed that William Lamb went on to become the prime minister of the UK and served as its PM from 1835 to 1841. There is a joke that there are no Australians in Australia. It is a country made of immigrants and as a result has no cuisine of its own. It is a melting pot of global cultures serving the best of world cuisines. The culinary scene in Melbourne was given a truly global touch by cafes that served cuisine from across the world brought in by settlers over the years. Melbourne’s cuisine draws on Polynesia, Asian and European inspiration and the results are staggeringly delicious! 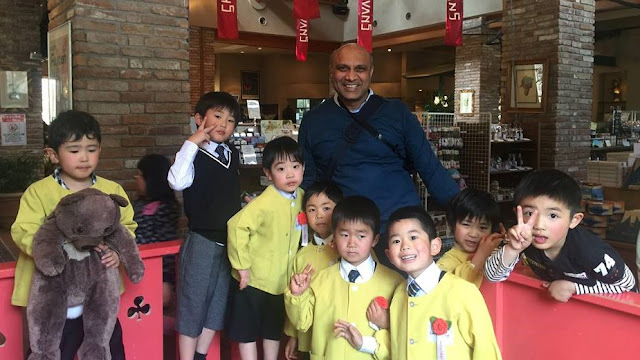 We hopped from one historical building to another and stopped for a bite at cheese cellars, Indian, Thai and Chinese outlets. We enjoyed a shot of espresso with the Italian family that brought Melbourne’s first espresso machine and dined with the Greek family that still runs the most popular Greek restaurant of Melbourne. All this while gulping Victorian state wines and beers! We finally reached Bourke Street Mall which is the retail heart of central business district (CBD). You have to be there to feel the buzz of this street. Many heritage shopping arcades have been given a modern makeover in Melbourne. Yet as a part of preserving the heritage, the city has not tampered with exteriors. This aspect of heritage conservation should be a lesson for urban authorities across the globe. Interesting bits were cafes that had sprung in old warehouses or shops. One saw leather, tailor or watchmaking spaces being converted in cafes that retained their old charm but served a truly modern meal. It was interesting walking through bylanes of Melbourne’s CBD, passing by grafitti lined walls, and restaurants and clubs in makeshift containers or bunkers, going through menus of wine bars, beer joints and breakfast places. The city’s bustling food scene gets you hooked. It was the lunch hour when we were strolling around as lanes had ceased to be walkways and were lined with small stalls on either side and were packed with tables and chairs full of professionals out to grab their afternoon meals. Cafe scene in Melbourne CBD is as eclectic as it gets. Just before were to have our last coffee with the guide, she explained to us Bourke Street was named after Sir Richard Bourke, who was governor of New South Wales. And it was Sir Richard Bourke who had named the city Melbourne in honour of then prime minister of the Kingdom, William Lamb, 2nd Viscount Melbourne. We may have heard about late Mr Lamb for the first time, but we sure are not going to forget the story or the experience ever in our lifetime.